San Jose, Calif. – Aimed at Internet of Things (IoT) applications, Fujitsu Component America, Inc. introduced an ultra-small Bluetooth smart module – the MBH7BLZ07 - that is approximately 50 percent smaller than its predecessor, the MBH7BLZ02. The small size and low-power consumption of the new module reduces the cost and time to develop smaller and lighter battery-powered wireless devices that are capable of operating much longer than before, said Fujitsu. 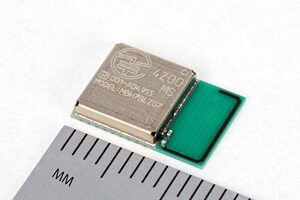 The new module measures 11.5 x 7.9 x 1.7 mm. It is based on the Nordic Semiconductor nRF51822 chipset (IC Rev. 3, S110 Ver. 8.0.0), which is built around a 32-bit ARM Cortex M0 CPU with 256-kB flash and 16-kB RAM. The low 10.5 mA power consumption (typical for 0 dBm in Tx mode), industrial temperature range of -40 to +85 degree C, and an embedded antenna make the FCC-approved module suited for wearable, Internet-enabled devices in healthcare, fitness, and consumer entertainment applications. The module contains Fujitsu’s unique data communication profile, which allows data communications without the need to develop profiles and software. Settings can be managed via a variety of text-based control commands (UART) to facilitate integration into new products, said Fujitsu. Fujitsu also offers the module in a blank version (PN MBH7BLZ07-109033) without embedded firmware, which can use the Nordic software library for application development, with full access to the onboard ARM Cortex M0 CPU. Availability: Samples and evaluation kits are available now. Pricing: See Where to Buy.